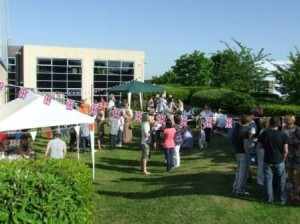 Keenpac’s Jubilee Celebrations got well and truly under way this month, with a BBQ and Garden Party, held in the ‘Keenpac Gardens’. With the sun blazing down, families and friends were able to enjoy the fun as well as soaking up the sun, at the start of this special Royal weekend. At the beginning of the day, our very own Lady Doreen judged the Keenpac Bake Off (a very difficult job! ), tasting the delicious cakes, all baked and decorated by Keenpac staff. And to finish – a sumptuous Barbecue feast served with delicious burgers, sausages, roasted vegetables, chicken, rice, salads, pittas, rolls and various pickles. Perfect.